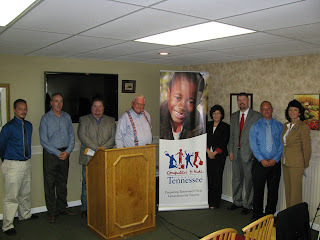 Connected Tennessee’s Computers 4 Kids (C4K) program, Congressman Marsha Blackburn, and several Perry Countyleaders gathered yesterday to celebrate the donation of computers to PerryCounty’s “Vision Perry” program, an innovative program that has put hundreds of Perry County citizens back to work over the past two years. In January 2009, unemployment in PerryCounty surged to 27 percent, and at that time was the 3rd highest rate in the country. That summer, working with AT&T, Connected Tennessee donated computers to the program, allowing for the creation of a Digital Factory, which put citizens throughout the county back to work and brought the unemployment rate down to a remarkable 17%. Today’s donation marks the next phase of the Vision Perry Digital Factory, which today employs nearly 100 people. While the lack of a four-lane highway and the remoteness in the county have in the past been major obstacles to attracting new business to the area, the “Digital Factory” is conducted entirely using the Internet. With the provision of computers from Connected Tennessee’s Computers 4 Kids program, VisionPerry piloted the Digital Factory Network that has transformed a traditional based manufacturing county into a high-technological area. In its first year as a pilot program, VisionPerry aggressively focused on stimulating a lifeless PerryCounty. Since its inception, the VisionPerry Digital Factory has transformed itself into a fully-equipped work center which offers training, job placement, and work space. In cooperation with county and local government, Connected Tennessee, the Tennessee Career Center, TDS, AT&T, TVA, Economic & Community Development, Department of Labor, and a dedicated staff, over seventy-five people in the area are currently working as a direct result of the program. Ten brand new computers were awarded to the Vision Perry program at yesterday’s event, added to the twenty donated in 2009. The event took place at the Commodore Hotel Linden in downtown Linden. City of Linden Mayor Jim Azbill and Perry County Mayor John Carroll were also on hand to show their support of the program. To date, C4K has distributed nearly 4,000 computers statewide. Marsha Blackburn SOTs from Roy Hutchins on Vimeo.